Breakfast is such an incredibly important beginning to the day, and means different things to each of us. My sister requires breakfast upon waking, it doesn’t matter what it is, but without it she becomes a snarling mess, not to be spoken to until she’s eaten. My dad was exactly the same, but with less snarling, and with far more importance put on what he was eating. Routine plays a huge part in peoples eating habits, more so in the morning when people tend to be limited for time, than at any other time of day, and so something quick and easy tends to win. Toast, cereal a quick piece of fruit while heading out the door. Or maybe just a coffee to tide you over until you have time to eat something. Despite working with food for a living, I am absolutely terrible at making time for breakfast, which is odd given that it is my favourite meal. I will always start my day with a cup of strong Earl Grey, but during a long morning of prep my breakfast might include a meatball, some apple cake, a spoonful of soup and some chutney. Give me a day off though and suddenly breakfast becomes all that I can think about. Even better, give me people to feed and a day off and my morning is perfect. I love that breakfast can include almost anything at all depending on your personal preference. Anything goes, it can be cake, eggs, fruit, cereal, chilli or potatoes. I also love to bake in the morning, theres nothing nicer to wake up to than the smell of freshly baked anything coming from the kitchen, and if its something that needs butter spread all over it, that makes it even better. But of course days off are few and far between, and so when I’m short of time a quick bowl of granola will do, and actually the smell of baking granola is pretty amazing too. 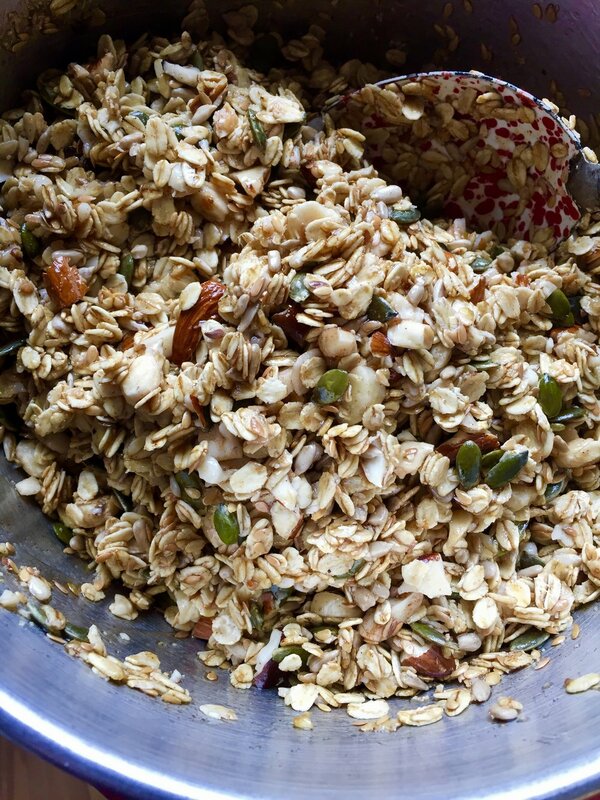 While there are some great store bought granola’s out there, making your own is far more satisfying. Not only is it less expensive, but you can make it exactly the way you like it. It can be loaded with fruit, nuts or seeds, or it can be a really simple blend, using just oats and honey. I don’t have much of a sweet tooth in the morning, so tend to lean towards nuts and seeds, with a little bit of dried fruit. But the great thing about it is that once you’ve got the basic recipe sorted, you can pretty much do whatever you want. Before we begin with the recipe, I just need to tell you that I use measuring cups. This comes as the result of having American parents, and far more American cook books than English. But for this recipe if you don’t have measuring cups its not a big deal at all, a good size tea cup with work just as well. 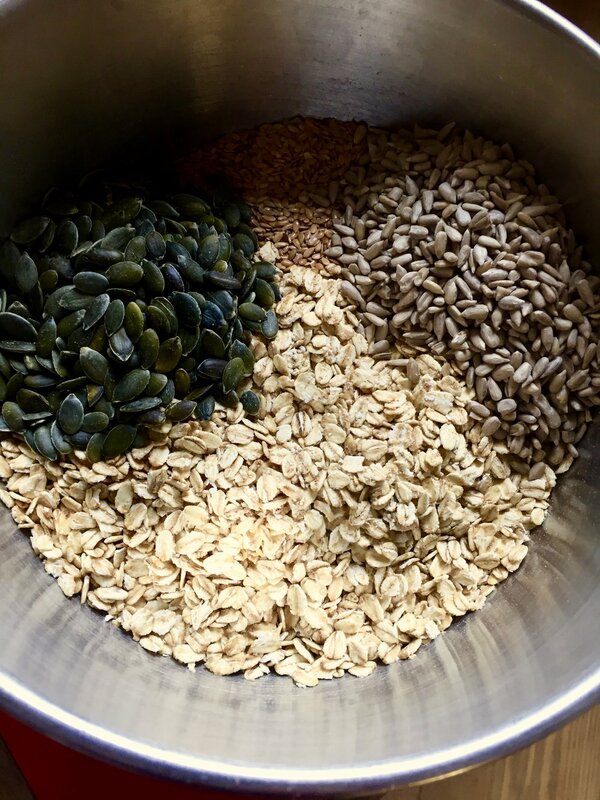 I tend to use a basic ratio of three cups of jumbo oats to two cups of nuts and seeds, this does tend to make it quite nut heavy, so just add and take away as you prefer. Put all of the wet ingredients into a medium size saucepan. Warm over a low heat for a few minutes. Watch this carefully as it has a tendency to boil over. in a large bowl mix all of the dry ingredients, except the dried fruit, which is added after its cooked. 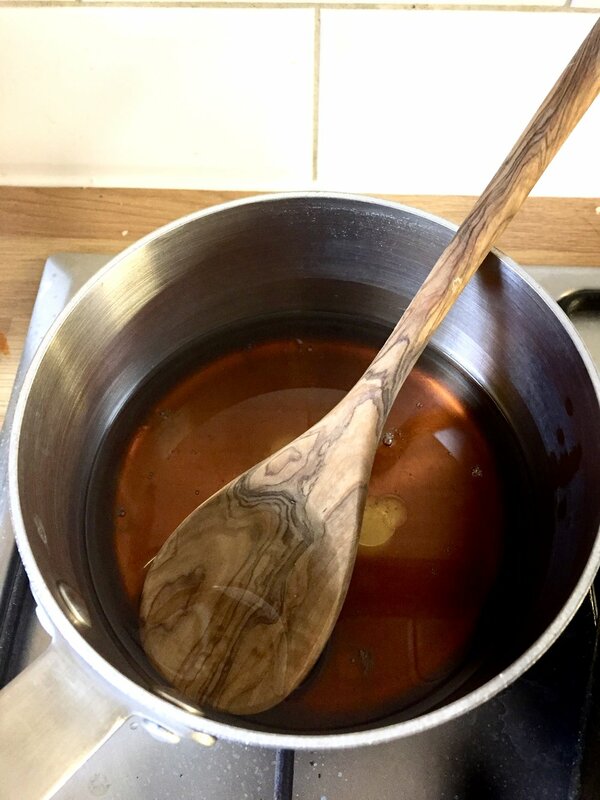 Pour the warmed liquid over the dry ingredients, and mix until everything is evenly coated. Spread mixture evenly onto a baking tray, one with a high side makes mixing easier. 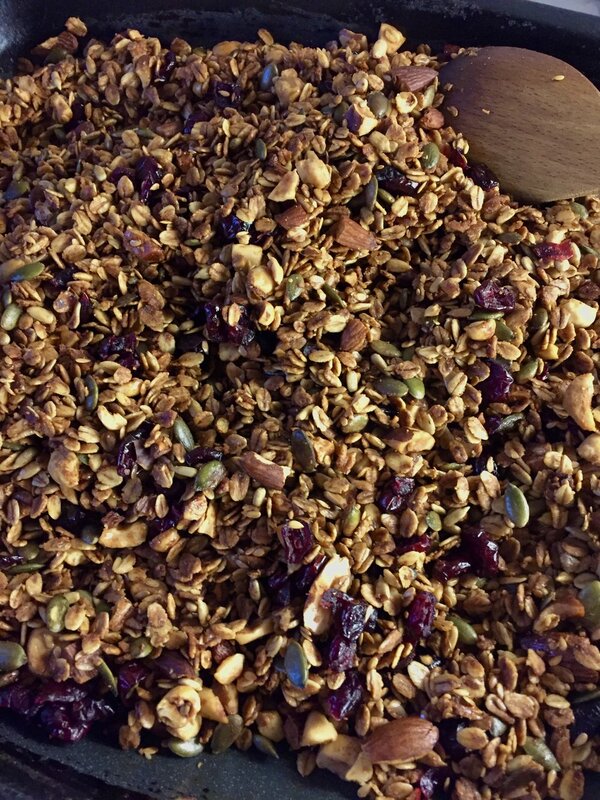 Bake granola in the oven for about 45 minutes to an hour, mixing every 15 minutes to ensure even cooking. Take out of the oven when a good toasty colour. After taking out of the oven, and while still warm, add dried fruit and mix well. Now leave in the tray to cool completely, and when cool place in an airtight container. It should last a good few weeks, unless you eat it all in one day.